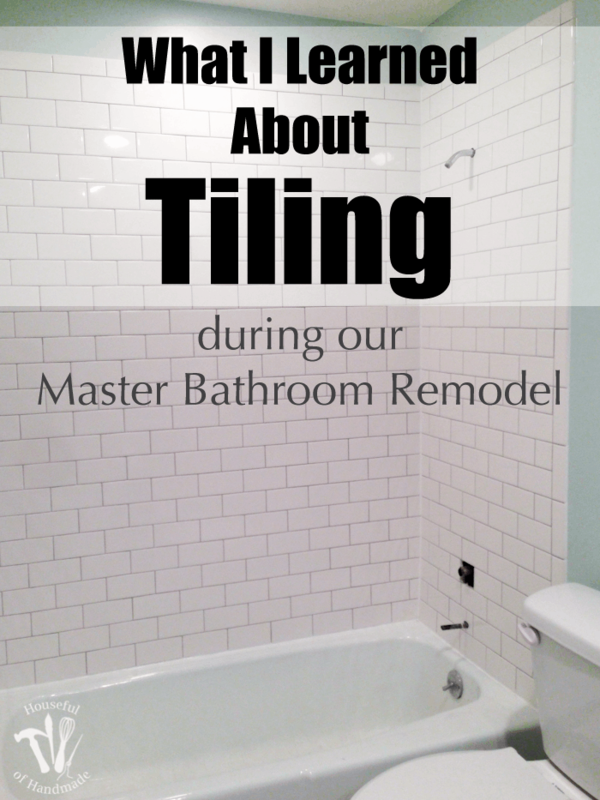 I can’t believe how long it has been since I have been able to share remodel updates with you. September and October were just a blur of activities with my kids and their schools. I was really hoping that once school started the last week of August I would have all kinds of free time to get things done, but no luck until now. I have nothing on the calendar for November except finishing up a couple home remodel projects and Thanksgiving. And it starts off with finally getting the master bathroom vanity installed. 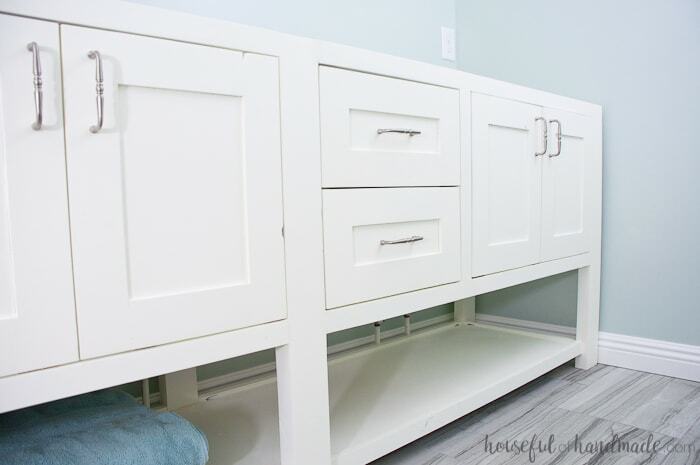 I’m going to let you in on a dirty little secret… when I shared the build plans for our open shelf master bathroom vanity, it was not installed. Not even the cupboard doors were installed! I hadn’t had a chance to get the hardware for the cupboard doors with all the back-to-school craziness so I totally cheated. Instead I used masking tape and taped the doors on to get pictures for the build plans. I am so sorry I tricked you, but it was a good trick (and honestly I can’t guarantee it will never happen again). I will be the first to admit that I was scared to install a bathroom vanity. Partially because I have never done it before and partially because I knew I would have to cut the vanity to make room for the pipes. I was terrified I would destroy my beautiful vanity so I kept putting it off. To my surprise, installing the bathroom vanity was super easily and everything looks great. We did have a couple challenges to deal with, but still, the vanity was installed and ready for the top in just an hour. When I had the pipes moved to the new bathroom wall many years ago, I had no clue what kind of vanity I wanted. I figured I would want a regular vanity so the plumber put the pipes through the floor instead of the wall. 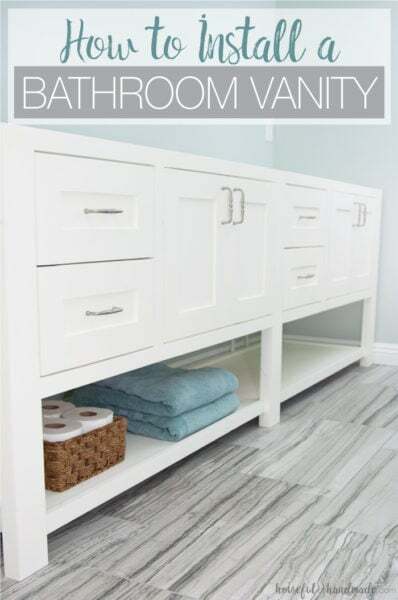 Fast forward to when I am putting together a mood board for the vanity, I fell in love with open shelf vanities over and over and over again. I decided that it would be just fine to make an open shelf vanity because the pipes would be well hidden, and I was right. 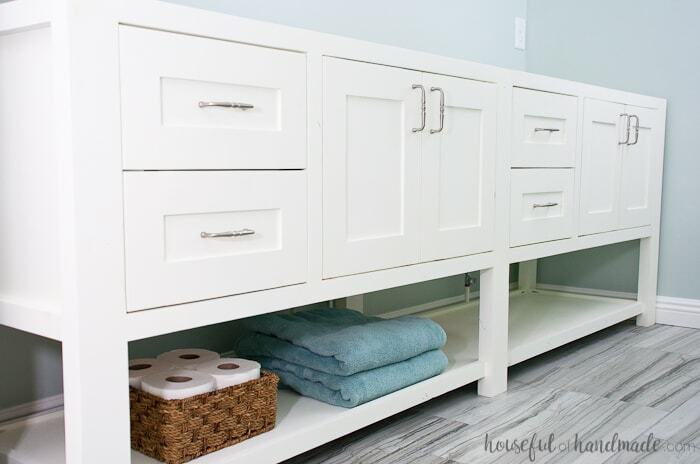 No one is going to see the pipes in the back of the vanity unless they get down and actually look for them under the shelf. Also, because we were making an open shelf vanity, we made sure to add baseboards around the entire bathroom, even behind the vanity. I knew I would have a gap between the vanity and the wall that would need to be addressed in the install, but it was actually really easy. Start by marking where you need to cut for your pipes. For our vanity, I needed to cut the back of the shelf so the vanity could lay flush with the baseboards on the back wall. The vanity had a trim piece around the bottom shelf, I used the nail gun to secure the trim right around the sections I would be cutting so the trim remained in place. Using the jigsaw, cut the sections you need to fit the pipes. For our vanity it meant just removing the trim around the bottom shelf. 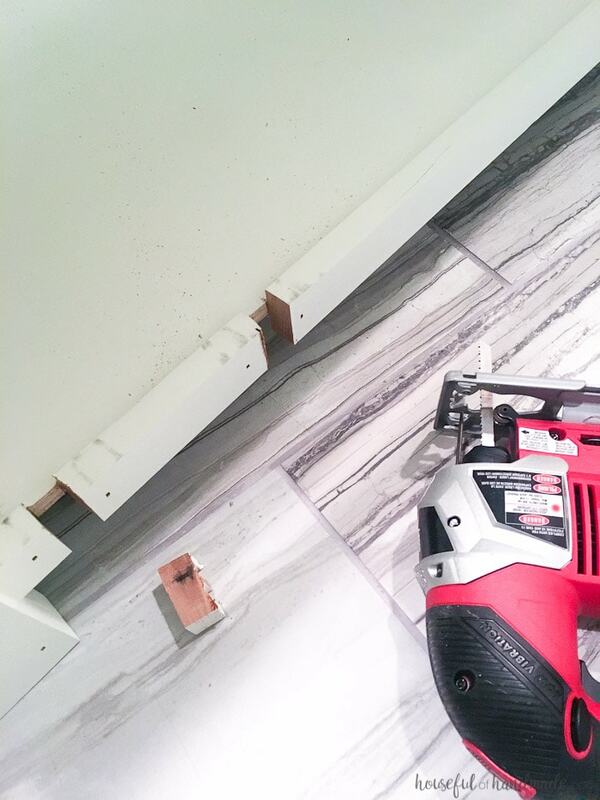 If you are cutting into the back of a regular vanity, you will need a drill to give you a starter hole to start your cutting. Slide the vanity up agains the wall. Check that the vanity is level and the pipes fit into the holes you cut. 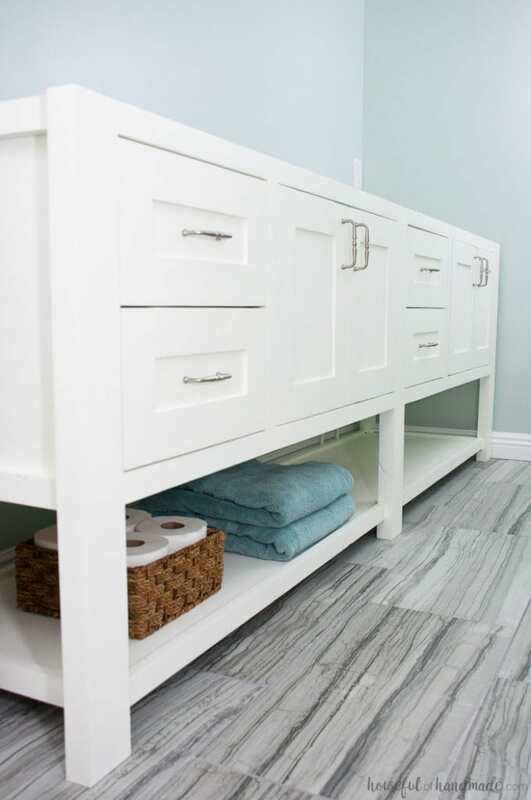 Use shims under the feet of the vanity as needed to ensure your vanity is level. 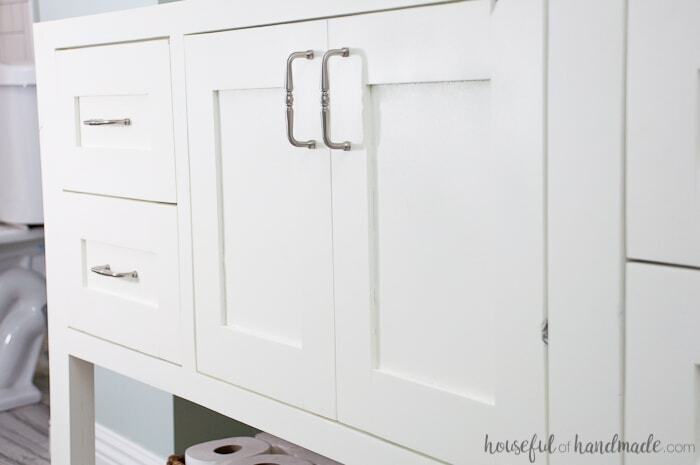 Find wall studs in the wall you are securing the vanity to. 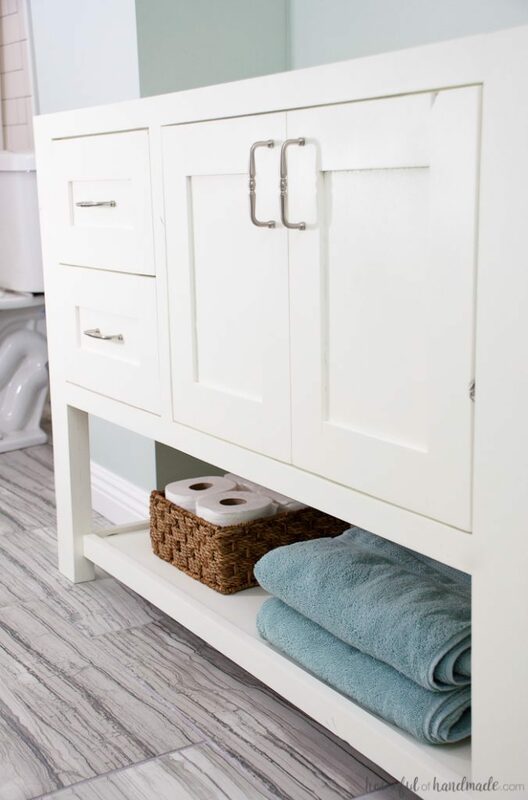 Use shims between the wall and the vanity to ensure the vanity is level and square to the wall. Since our vanity had a gap between the frame and the wall because of the baseboards, I used a scrap piece of wood between the frame of the vanity and the wall. Also, the wall our vanity is on was not very straight. On the right side of the vanity I had a 3/4″ gap between the wall and vanity but on the left side it was a 1 1/4″ gap. Since I was using scrap pieces of wood to between the vanity and wall, and I didn’t have a second set of hands, I used my nail gun to attach the scrap pieces of wood to the vanity so they would stay in place while I drilled the pilot holes into the vanity and shims. 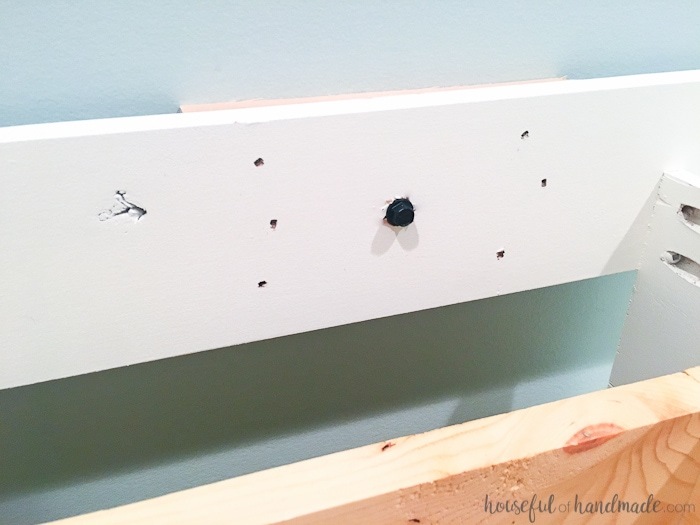 Using wood screws, secure the frame of the vanity into wall studs. I recommend pre-drilling pilot holes in your vanity and shims so you don’t split them. 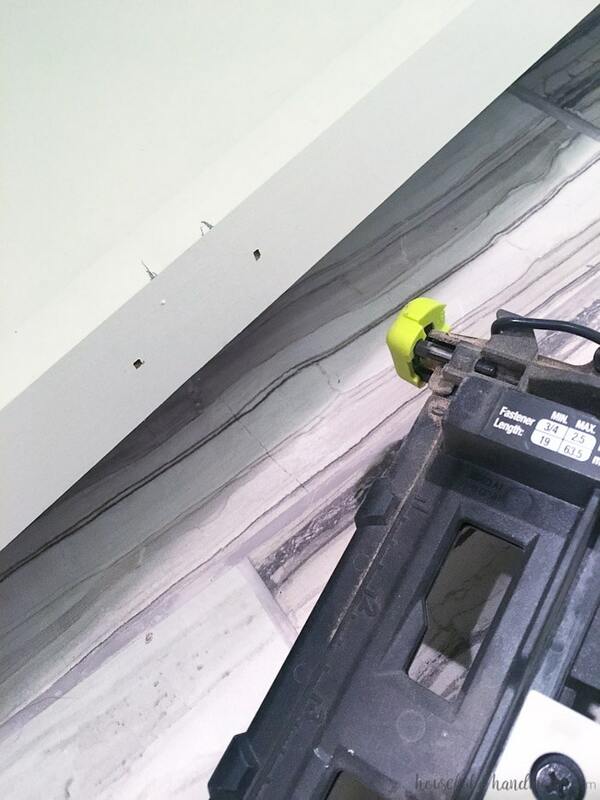 Make sure your screws are long enough to go through the vanity, scrap wood, drywall, and are secure into the wall studs. Continue to check for level as your continue to secure the vanity. 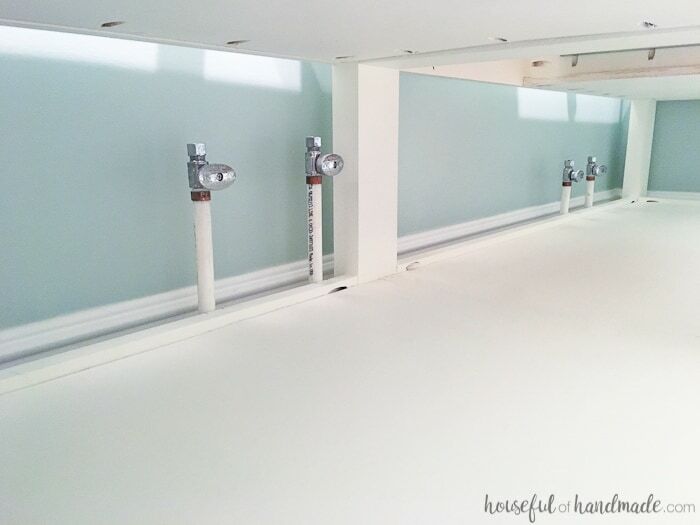 I attached our 8′ vanity to the wall in 3 places: one on either side and one in the middle. Now our vanity is not going anywhere! I can pull as hard as I want on the drawers (even though I don’t want to pull hard on them) and everything is secure. Next step, I need to find the perfect door hinges and start working on the vanity top. Hopefully our Christmas present will be a fully functional master bathroom. That would be a Christmas miracle! 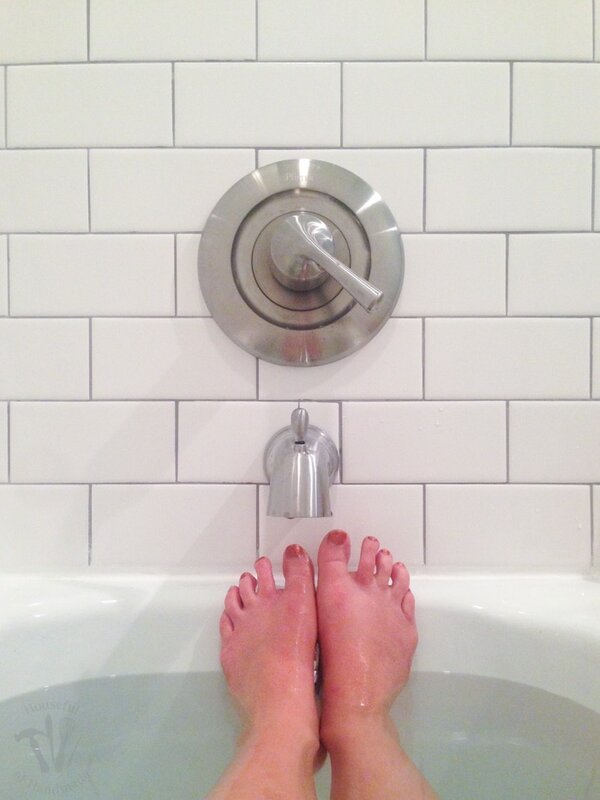 It looks amazing and I can’t help but notice your beautiful bathroom floors too. I bet it must feel so good to have your bathroom almost complete! Thanks Erlene! I couldn’t be more excited to have the bathroom almost done. It’s been way too long.